Bonfire Agency » What? You Don’t Speak Klingon? Any brand marketer or student of sociology (and, really, shouldn’t they be one and the same?) still in doubt over the relevance and persuasive power of the “geek factor” within the broader culture need only pay attention the next time “Greetings,” Apple’s new ad promoting the iPhone 5c, breaks up the monotony of “The Middle” or diverts one’s attention away from Facebook kitties. Created by TBWA\Media Arts Lab, USA, the :30 spot and its extended one-minute version feature a strategically selected lineup of colorful characters using their colorful phones to actually make and receive calls (!) more, uh…colorfully. 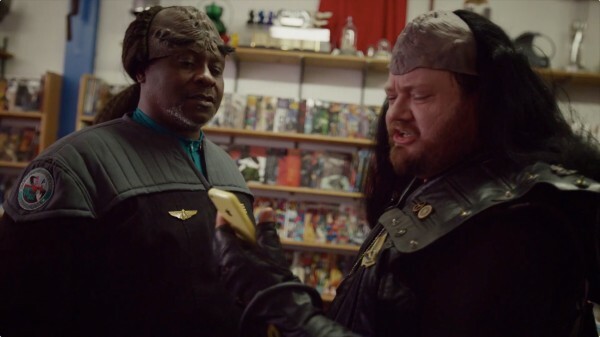 Aside from the guy who shrieks “Heyyy!” at the open, the breakout stars appear to be a couple of Trekkers…in full Next Generation regalia…talking in Klingon…while standing in a comic shop! We’re not sure if this counts as the first time cosplay has been recognized by a TV commercial, but it certainly adds more fuel to the fire that we’ve been stoking for close to three years here at Bonfire – namely, that the “geek next door” might just be your brand’s next and most influential advocate. Add in the Harajuku girls who “meow” at the end and this sweet confection of a commercial may be the most reflective of the pop life as we know it.